Problems with your Pinterest account in Tailwind? It might be time to reconnect. See how you can do it here. Ruh-roh! Are you getting a pesky, "Please Re-Connect Your Pinterest Account" pop-up over and over? Or maybe you've been noticing that your data isn't being updated every day or is missing. Sometimes all you need is a fresh new "sync" between Tailwind and Pinterest. We call that an "Authentication Token." Go into your Pinterest account settings directly on Pinterest. 2. Scroll down to the "Apps" section, and click on the Revoke Access button where you see Tailwind. 3. 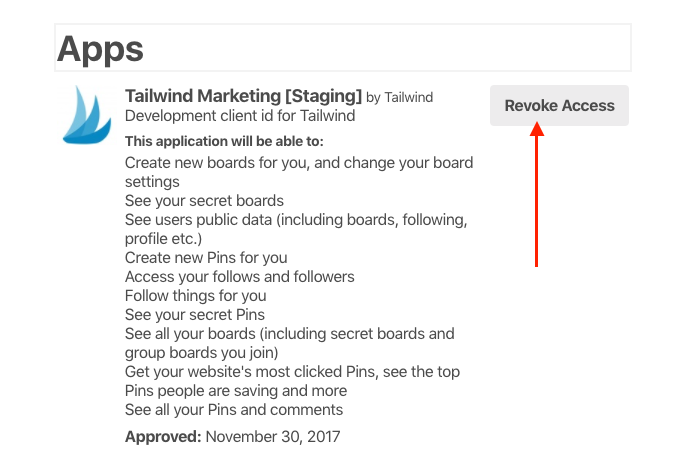 Once you've done this, back in Tailwind Connect Your Pinterest Account to activate Secure Pin Scheduling and Analytics!